The Interpol show at Toad’s Place in New Haven was great for so many reasons, not the least of which is that the photos that I took got picked up by qromag.com and led to my being asked to cover St. Vincent, tUnE-yArDs, and Basia Bulat for them at Central Park Summerstage a week later. 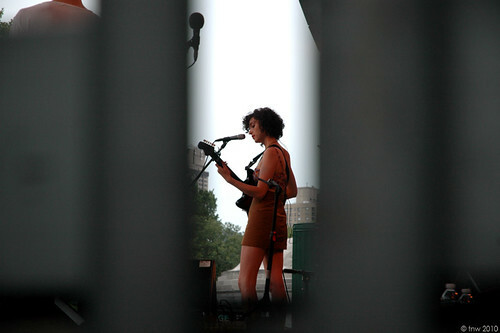 The show was on a Sunday, and I’m a fan of St. Vincent anyway–especially live. I’d photographed her once before, back in 2008 at the Middle East with none other than Basia Bulat. tUnE-yArDs was new to me, but came with my good friend Doug‘s endorsement, so the whole thing was really a no-brainer. We’ve decided that it’s much nicer to approach New York by car from the North than it is to approach it from the South. From the North you pass through Scarsdale and that whole area, whereas from the South it’s all Jersey and tunnels. We arrived in time to pick up my pass, scope out the food and drink offerings, and generally get the lay of the land. We got a reasonable deal on parking in a garage practically across the street from Summerstage as well. There was a pretty cool booth set up–it may be there for all the shows–where you could buy custom silk-screened t-shirts. I realized once I got home that Merrill Garbus, the woman behind tUnE-yArDs, was purchasing a shirt when I was photographing the booth. The fabulous Merrill Garbus (tUnE-yArDs) buying a custom-silkscreened t-shirt at Central Park Summerstage before her show with St. Vincent and Basia Bulat. Merrill, I promise that I took better pictures of you that day–see below! There was a big photo pit, and quite a few other photographers were working the show. It was supposed to rain, but nary a drop fell all afternoon. Basia Bulat exudes a genuine sweetness. She’s the kind of performer that you can describe as refreshing and not feel cheesy or cliched for saying it. I’m not positive, but it looked to me like she was playing with the same group she had assembled when we saw her back in 2008, including her brother on drums. 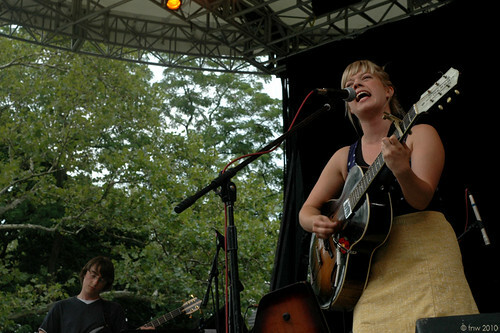 Basia Bulat at Central Park Summerstage. Photo by Terri Wise, www.qromag.com. Highlights for me were “In the Night” and “Before I Knew,” both from the album Oh, My Darling. The rest was good, too, but I admit that my previous familiarity with those two songs made them stand out for me. Basia Bulat. Photo by Terri Wise, www.qromag.com. Next up was tUnE-yArDs. I think it would be fair to say that she pretty much stole the show. That’s saying something, because both Basia Bulat and St. Vincent played well. 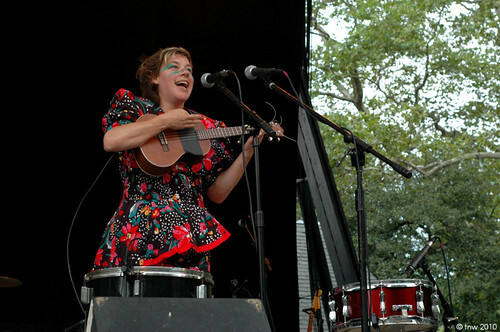 tUnE-yArDs. Photo by Terri Wise, www.qromag.com. People say she ratchets everything up a notch for her live performances, and now that I’ve heard her recorded material, I can vouch for that assessment. It’s not that the recordings aren’t enjoyable, but the live performance has significantly more kick, more fire. She drew in the crowd almost immediately and had everyone dancing, at one point jumping up and down, and cheering for more. When she sang “throw your money on the ground” in “Yes You,” I swear a few people were probably emptying their pockets. 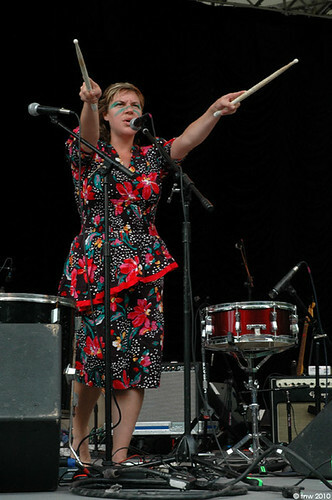 tUnE-yArDs at Central Park Summerstage. Photo by Terri Wise, www.qromag.com. Her set left me wondering what we can expect from her new record, which I believe she is finishing up as soon as she wraps up her current tour. If she captures half of what she showed live, the record’s going to be awfully good. Good friend Doug (mentioned above) pointed us to a live recording of a show she did at The Rock Shop in Brooklyn the next night. I HIGHLY recommend it. It was a long afternoon, and though I was honestly starting to feel a little wiped out by the time St. Vincent got started, her set did not disappoint. What did disappoint a little bit was the sound. From where I was standing for most of her set–kind of off to the side–I couldn’t tell exactly what was wrong, but people were calling out for the sound guys to turn down the bass. It was a bit distracting, but I didn’t notice it after a while. St. Vincent at Central Park Summerstage. Photo by Terri Wise, www.qromag.com. Every time I see her perform I am struck both by her cuteness and by her seriousness as an artist. She assembled quite an impressive backing band–including, I realized toward the end of the show, Ian Hendrickson-Smith, a guy I knew briefly in school back in State College. I’d seen her on one of her first shows in support of her second album, Actor, and at that time the songs sounded perfectly fine to me–but just fine. As I would expect, the songs sound much better now that she’s been playing them live for a while. As before, the one older tune that she pulled out was “Your Lips Are Red,” which includes one of my favorite lines: “Your skin’s so fair, it’s not fair.” I know Actor was only released last year, and it’s a good album, but I find myself ready for new material from her. The show wrapped up slightly early–just in time for us to get back to our car before the garage rate went up. On top of the show itself and the experience of photographing it (outdoors, in the daytime, which was good practice since I’m used to shooting in smaller, darker places at night), it was nice to just be in New York on a Sunday. I look forward to doing more of this sort of thing when the right opportunities present themselves. Previous PostDelta 5-CircuitNext PostNew Land of Talk! Good pics, I hadn’t seen all of these. You didn’t mention about Ian H-S…funny. Did I mention that Ian has been playing with Sharon Jones? I guess he is or has been a touring Dap-King. And I thought Dap royalty was hereditary. Good to now. Now I have something to shoot for.